Primer is a product which is a godsend, believe me! Priming the face is an important step to add to your makeup routine. Whether you are a person who wears a full face of makeup on a daily basis or a person who would like to keep it simple with just a BB/CC cream and a tinted lip balm, adding primer to your makeup routine works wonders. However, priming the face is the step that people often miss out on or just skip it. In one of my recent post, I have recommended to “always use a primer before applying your makeup” and I have received a few quires on the same as if it is really necessary to use the primer always, so my answer to your question is definitely YES! It is essential to use a primer always if you are applying the makeup in the monsoon because your makeup can wash off with the rains and primer is a life saver. And even if it’s not rainy, one should use a primer in all the seasons out there because using a primer underneath your makeup makes a world of a difference. You will never completely understand this until you’ve tried it on your own. Primers have numerous benefits to your skin. It is a base for foundation and/or face makeup which is applied after your moisturizer and before your foundation (BB/CC cream). It gives you a smooth canvas to work with, it covers facial defects, it ensures a more natural finish, it helps your makeup last longer. Some primers also contain SPF so it protects your skin from harmful UV rays. Also, primers help to create an extra layer between your skin and your makeup which protects your skin from any damage that makeup can cause to your skin. 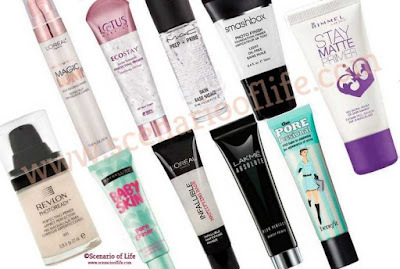 You may know about the face primer, but there are a variety of primers which are available. There is one for each stage of your makeup, be it for your eye (eyelids and upper eye area), eyelashes, eyebrows, lips, and nails too. Primers are of different types, they come in different formulas and shades. The formulas that are available are gel/silicon-based, water-based and cream based. And the shades in which they come are green, purple/blue, yellow, peach, and pink. So do you wondering if the primer comes in so many forms then which one is the right choice for your skin? Well, don’t worry. Just keep reading and find it out. If you have excessive red or yellow tones in your skin, you should go for a color-correcting type of primer. They are the best choice for you. There are other primers that add luminosity to your skin. Another primer comes with skincare properties which correct the dark spots or any pigmentation. A green colored primer conceals the areas of redness. Use this if you have acne prone skin. A light purple/lavender or blue tinted primer brightens the skin tone. Use this if your skin is sallow. A yellow hue primer evens out a ruddy (pink/light reddish) tone and erases tiredness of skin. Use this if you have ruddiness in your skin. A peach shade helps to conceal bruising or pigmentation. Use this if you are looking to conceal the discoloration such as sunburn, veins, under eye circles. A pink shade primer adds radiance to the skin and makes the complexion look healthier. Use this if you are dealing with a dull complexion. Brightening/illuminating primer are great options too. If you have oily skin and you are looking for something that will control the oil then you should use a mattifying primer. If you have dry skin and you are looking for something that will nourish your skin then you should go for a hydrating primer. If you are someone who has large open pores and wants to minimize then you should use pore minimizing primer. And if you don’t have any major skin issues and are looking for something that extends the wear time of your makeup, then you should opt for a smoothening primer. There are two main different types of primers; one is silicone-based and the other is water-based. A Silicone-based primer is very popular in the beauty market as it smooths out the texture of the skin. It has ultra smoothing effects because it contains dimethicone (silicone-based polymers), The main function of the silicone-based primer is to minimize the pores and fine lines along with increasing the longevity of the makeup. A water-based primer also extends your makeup wear but it won't cover the fine lines or minimize the pores. And a water-based primer is best for those who have oilier or acne prone skin or has other skin conditions because sometimes the silicone can clog your pores and you may have slight irritation and/or allergic reaction. So, if you are not using makeup primer, then you are really missing out on an amazing product because it really makes a huge difference if you do apply it. Disclaimer: Always do a patch test first, or check with your medical professional, to see if your skin is allergic to a silicone-based polymer that's present in the primers (the dimethicone). Everyone's skin is different so results can vary from person to person. Please discontinue use if your skin does not react well to it. What's your makeup routine? Do you wear a full face of makeup every day or prefer to keep it simple? Do you use a primer; if yes which one suits you the best? Let me know in the comment section below. I would love to know. I am such a newbie at make up even though I been wearing makeup for about 8 years.I don't even wear primer because I am not a makeup person. But after reading your post, now I know the importance of wearing primer. I know my daughter isn't quite at the makeup phase yet, but she is getting there. I will have to show her this to give her the basics. I am sure she would appreciate it. I don't wear makeup very often however when I do I like to experiment with different shades and tones. 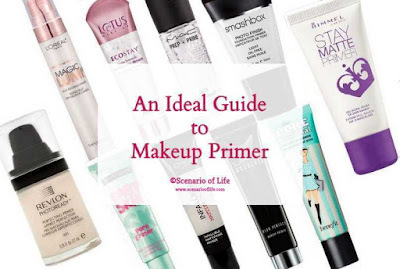 I had no idea that there were so many types of makeup primers out there. It is really interesting! Thanks a lot for sharing this post. I am not very good in doing makeup, but sometimes if you know the tricks, you can give yourself some quick makeover. This post will work as a guide. I don't wear make up but this is fun to read since it contains thorough information about the primer. Will definitely share this to my friends who love make up. Thank you for this blog post!